When I moved to this blog from my old one, I explained that it would include more than just stuff relating to my role as a father in the narrow sense, but would be about me more generally, because I want my kids to see more about who I am. So activities previously captured in other blogs would now live here. In adherenece to this policy, prepare yourself for a post about mountain biking. Anyone following me on Twitter will know I have been injecting excited comments about my new bike, a Boardman HT Pro. 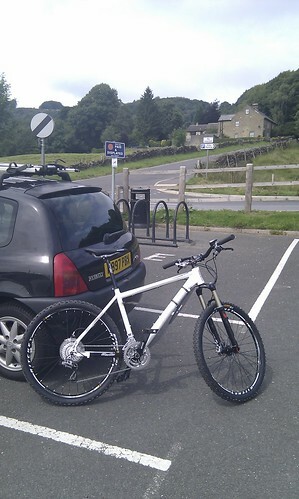 Well yesterday I finally took it out for a proper ride with plenty of off-road climbs and descents. I drove to the historic village of Eyam in Derbyshire. It is a very picturesque spot, doubly so for me as it is a little further afield than my usual cycling haunts, so both the riding and the scenery have a fresh feel to them. I took a pre-planned route and a little map of the area. You can see the route here. In all I covered over 20 miles in around 3 hours with a top speed of 34mph and an average speed of 10mph. Before you tell me I can’t do the math, my cycle computer also told me at the end that I had been moving for a little over 2 hours. In other words I spent about a third of the ride gasping for breath at the top of a climb and/or staring at the map trying not to get lost (again). 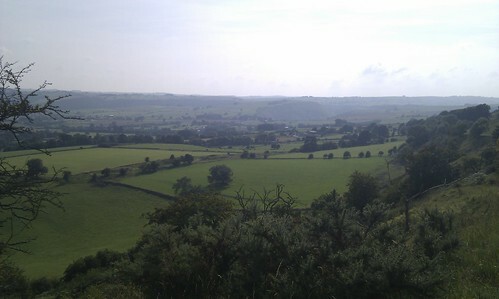 Oh and taking in the beautiful scenery, yeah, that’ll be it. Oh, the bike. Well (as I tweeted earlier), it was rocket-fast and super-assured, which was handy as its rider was neither. Seriously though, it is so light it made me want to ride fast and I completed climbs in a higher gear than I would have expected. It descends rocky and loose terrain well and would climb like the proverbial goat if I were just a little fitter. In any case it climbed well for the first few yards of any climb before I ran out of steam. In other words, this bike is basically too good for me! But man, it made me grin all afternoon. And to be honest there IS a fatherhood related point to all this. I so rarely get time to go out on a long, hilly ride on a sunny day, that yesterday was an enormously liberating and uplifting experience. I love being with my family but I also love some things they can’t (or wouldn’t want to) share in. There’s no way I could take my kids over the sort of terrain I rode yesterday! My only slight sadness on the ride was that I missed having Hayley there, as she used to ride in that area with me. But I’m sure I can get her out there again at some point. In any case, it refreshed me and recharged my batteries in a way that few things can. And that can’t be bad for me or my family. Thanks Selina. I agree that some "me time" for both parents is essential. We even have the concept of a weekly "night off" from the kids in our house, where one of us is free from the bedtime routine to spend the evening entirely as they please. This is really true that when we become parents then we are more concern about our kids as compared to ourselves. I must say that you are really caring and a great father who loves his kids madly. I need to order best essays for an assignment please help.